Home > Children & Reading > Questionnaire: Does Your Child Like Reading? Children can have strong reading skills but still not enjoy reading as an activity, and unfortunately this limits them not only in terms of leisure options but in being exposed to new ideas, new questions, new characters and new experiences. It’s hard to argue that a love of reading enriches a childhood as well as a long life. To help you determine your child’s attitudes towards reading we have put together the following questionnaire. Answer “yes” or “no” to each question, total your answers and match your results to the explanations at the end to help ascertain if your child likes reading. 1. Does your child have a daily reading routine? 2. Does your child enjoy trips to bookshops and libraries? 3. Does your child talk to you about books, magazines, newspapers, etc? 4. Does your child use books as a way to answer questions or get information? 5. Does your child ask for books as gifts? 6. Does your child read signs, letters, notices, cereal boxes, etc? 7. Does your child read without drawing attention to it or asking for a reward? 8. Does your child want to read aloud to others? 9. Does your child want to read books before seeing their film adaptations? 10. Does your child become excited by reaching reading milestones? 11. Does your child routinely reference favourite stories or characters? 12. Does your child tell you his or her thoughts on reading in general? Does Your Child Like Reading? If you answered “yes” to between zero and four questions then it is not likely your child likes reading. It may be that reading is a struggle for your child, that (s)he has never come across a book (s)he has enjoyed or that (s)he’s somehow picked up the idea that reading isn’t important or “cool”. Rather than forcing books on your child, talk to him or her about why reading is enjoyable and important. Devote a trip to the bookshop or library just to finding books that (s)he might like. Purchase a special reading lamp, reading journal or bookmark to help your child get excited about reading. If your child confides that reading is hard, ask why and consult with his or her teacher immediately to decide how to better investigate these concerns. 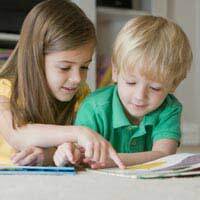 In the meantime, try moving down to lower reading levels and read books together so that you can keep an eye on your child’s reading progress. If you answered “yes” to between five and eight questions then your child may like reading. It’s probably a safe bet that your child has a few books or stories (s)he enjoys, but feels that they are the exception rather than the rule when it comes to reading. Use these books as a starting point. Ask your child what (s)he liked about them: was it the characters? Plot? Tone? That you used to read them together? That the teacher read them aloud? Use these answers to form a better idea of the kinds of books your child likes, then bring him or her to a bookshop or library and teach them how to browse for similar stories. If you answered “yes” to nine or more questions then it is highly likely that your child likes reading. There’s no doubt that your child’s behaviour points towards an enjoyment of the written word, so celebrate this rather than take it for granted. Splurge on a new book or book tokens “just because” and ask your child about his or her reading habits. Where and when does (s)he like to read? What could make his or her reading sessions more enjoyable? What does (s)he like best about reading? Why does she prefer this to other, perhaps more social, activities? While it is excellent that your child enjoys reading, just make sure (s)he doesn’t use it as an escape from problems or conflicts that remain unaddressed.